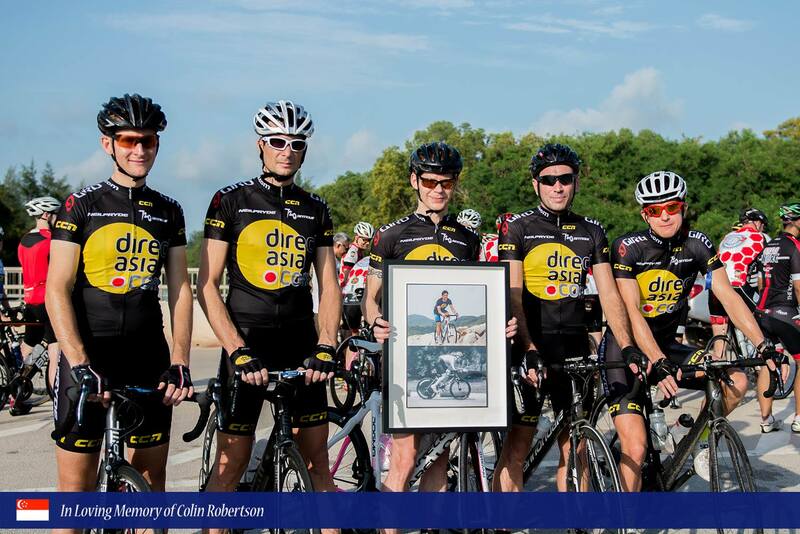 Last Saturday saw the tremendously well attended tribute ride to Colin Robertson. 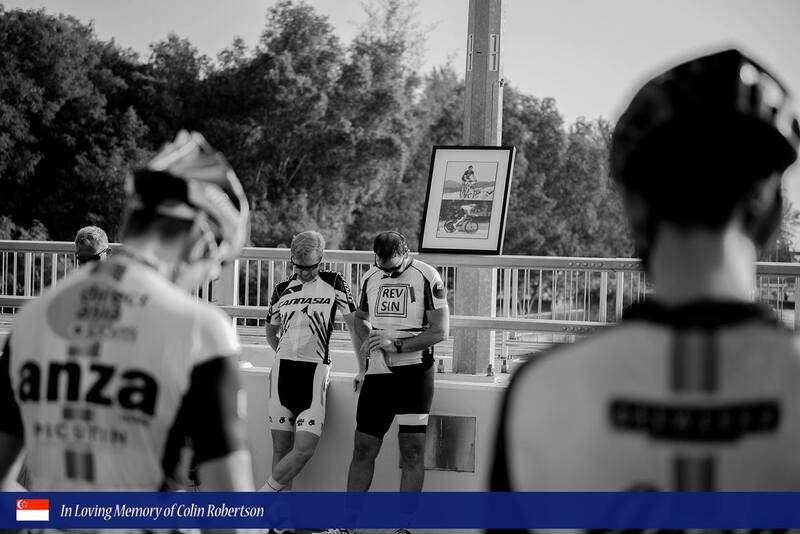 The gentle ride out to Changi was attended by 200+ riders with all the major clubs coming together to pay their respects to a an amazing rider and a good guy. What was clear from the chat on the way out was how people were suddenly more aware of our vulnerability on the road. I wanted to use this as an opportunity to remind everyone for the need to carry some ID and contact information when you’re out riding – in case something unfortunate should happen. On a more upbeat note, the summer slowdown is finally over and the RTI Monkeys have again been chained to the typewriters to churn out some content. Today we’re blessed with 2 accounts of the recent KL road trip, a Viking Under The Helmet and Martins regular Triathlon update. Whatever you’re riding this week this week, keep it safe out there. We had a great weekend on the beautiful roads near KL. Our host Mark Losi told me that the name Kuala Lumpur comes from Kua-La, “hilly hill”, and Lum-pur “rainy rainforest”, and I wish we had the same on the outskirts of Singapore (as you all know Singa = “blue smoke”, Pura = “friendly truckie”). I struggled on the bike so I’ll be brief on the ride report. Many valid excuses, but the main reason for struggle is that I tried to follow Raoul and Craig. I shouldn’t have done that. They killed me on the front side of “Evian”. Evian is a deceiving little bump, that looks like nothing on the ride profile, but that got a few of us by surprise. Later I found a good rhythm on the main climb of the day, Bukit Fraser, until I cramped massively to the point that I had to stop at a road sign because I couldn’t move or get off the bike. A bit of sightseeing from the side of the road and many start-stops later, I made it painfully to the top where our peloton of 19 riders regrouped around a nasi goreng that was not very goreng. Such a great location deserves a better restaurant where the meriting cyclist should be rewarded with a five course meal including duck, wine and mousse au chocolat. At that point we had tallied 100 km including the 35 km climb of Fraser and everyone was proud of this achievement. The 100 km return trip was surely going to be a walk in the park. The descent was awesome. A fantastic surprise as I had completely neglected it, focusing only on the climb. It was like downhill skiing. One problem though: I probably spent more energy there than I should have, considering that the remaining 60 km were not going to be completely flat. The back side of Evian was like the front side, but worse. I had to walk /creep the last k. Casualties everywhere. Derek and Laura still standing on their bike but hardly faster than me on foot. At the top I resigned myself to wait for the van. Except that the van never came, so after recovering to zombie level (from sub-zombie), I had to ride back. We had a good rest in the VIP lounge of Mark Losi’s chateau. And went for more of the same on Sunday, with a mini-ride of 70 km to Genting Sempah, and once again a beautiful helter skelter in the jungle. – 19 riders. 4 chicks who all chicked me. – let the slower riders leave earlier so that everyone reaches the top a around the same time and can enjoy the mousse au chocolat. … the bus went well. Even with the traffic jams at the Tuas border, we still made it in approximately 6 hours door to door, which is what I had in mind. And the reclining seats were comfy enough for the team to get some sleep. The bus had a lower compartment where we squeezed 11 bikes vertically (bring blankets or removalist plastic wrap to separate the bikes). We could have added 3 or 4 more bikes (in bags) on the free seats of the top deck. Thanks to Megan for her great help in advertising this ride, recruiting at the Coffe Bean, and preparing the trip. Huge thanks to Mark Losi for treating us like kings and for organising the rides. Thanks to ANZA Cycling and the sponsors for their support. Looking forward to the next destination, we will return to KL shortly for sure. The Maître’d appeared somewhat perplexed as Megan and I rocked up for breakfast in full ANZA kit and tried to check-in our bikes like they were coats at a restaurant. Needless to say, the staff handled the situation seamlessly, as we cried out for coffee. A delayed departure, and late night chatting – meant that we had only managed to get about 4 hours sleep, not exactly ideal for taking on the challenge ahead. But we weren’t complaining. A quick quaff, and some substantial carbs from the fine Asian/continental buffet, we were on track for our 7am rollout for the big day ahead. Then ensued the typical last minute faffing, tyre pumping, multiple head-counting, establishing of lead van vs. sag wagon etc… followed by a thorough briefing by our wonderful host; Mark Losi, Esquire. Collectively the group had opted for the ‘VERY HARD’ route… which included day 2 of Mark Haller’s infamous ‘Brutal Double Header’. Mr Losi kindly gave each of us a written sheet of directions (I will come back to this point later) – where he had broken the ride into 5 respectable chunks for 100km. Plus the 6th chunk – which was, quite eloquently put ‘repeat in reverse’. We agreed to roll out as a group for the first 14km until we reached the outskirts of KL. This would be followed by a flat stretch, and a cheeky climb called The Wall, which would complete the first 30 clicks of the day, and take us to the first water/fuel stop. The roll out was great, until 10 minutes in, we had our first, and thankfully only, flat for the whole weekend. Undeterred and now very eager… we continued our way to the first drink stop. The Wall, although not long, packed a punch. Determined to do this in my big chain ring, I sat in to successfully grind up. ‘Evian’ on the other hand, was a different story, a much longer climb. Obsessed with my HR monitor, I managed to get up this one in Zone 3. The scenery was quite beautiful, only marred by the awful litter strewn about on the side of the road… plastic bottles and bags, tissues, styrofoam containers: such a shame. Road kill also helped pass the time; flattened lizards and snakes and most distressful was a monkey, whose skull was cracked in two like a coconut. And of course there were the imaginary animals and insects – rope snakes, tube snakes, ‘leaf’ lizards and so on… HR now Zone 5!!!! Delirious. Water please J. As I arrived at the peak of ‘Evian’ (so named for the spot where locals come to collect water), the faster group were ready to descend. The natural order of things had been established, I was now with second group. A quick gel, slice of cake, and a 100+ and we were ready to make our way along to the 60k marker. I don’t remember too much about the next stretch, as I was focused on the main event ahead; the Fraser’s climb. Although I do remember one pretty fast descent, which seemed to drag on for a while. Descending – not my greatest skill, I further slipped to the back of the ride. Mark Losi kindly reminded me that we had to go back up there on the way home. I am not too sure how I feel about that, as we keep the pace steady. As we reach the 60k fuel stop at KKB, the faster group has now split again with Ståle, Phipster, Raoul, Craig, Derek (and another Phil?! – there were three!) – leading the charge. I now want to take a pee. I opt to drop my daks behind a tree, only to be advised, that my bum would be facing the police station. Change of plan. The police let me use their facilities. (First kitten spotted but I digress). By the time I finish my comfort break; the middle group, have left. Bruce Morris and I have formed a new friendship. We start the climb together along a great wide flat road, next to a reservoir, which continues on its way to Fraser’s. I did feel a bit sorry for Bruce, as he had to put up with my incessant questioning: ‘what percent is it now?’ – every 45 seconds. He was very kind and humoured me all the way to ‘The Gap’. We were averaging somewhere between 15km – 18km, which I thought was pretty respectable, and my heartrate was thankful. We opted for another quick break at the Gap, another 100+ downed, we make our final ascent, at this point I drop into my small chain ring. The last memory of this climb, was single digit speed, but this time was around 11/12kph– so went much quicker (I’d like to thank our sponsors Athlete Lab for this). I was also thankful, that there was a 600m decent, 2km from the summit. Both Bruce and I rolled into Fraser’s Central, ready for makan. There was a huge fanfare; as there was an International Chicken Race going on (or some such nonsense), where VIPs were favoured for lunch over paying cyclists. A few of us were getting ‘hangry’. But nothing quite like fried rice and chicken, and an egg, and another piece of fried chicken, and a soya bean drink and a Tea Halia… after a big climb… oh and some more cake. We waited for the last riders, to reach the summit, and have some nosh – before we began the ride home. A fabulous descent back to KKB of winding roads (and headwinds… this hardly seemed fair). Somehow I had managed to join the middle group, Bruce and I again working in tandem, and with Megan, Nico, Lenka, Derek, Phil and others… all was well, and then came the pain. Poor Bruce cramped up, and encouraged me to ride on… somehow, I had found a second wind. One final descent found me sadly separated from the group. I reverted to the written sheet of instructions, which of course in true black-comedy fashion, was soaking wet from the dip, and completely illegible. Feeling quite confident nonethless, I follow signs into KL – only to end up on the motorway. With a further 16km in to KL, rapidly fading light and a dodgy sense of direction – I opt for the only sensible choice. Once again we ravenously descended on the hotel’s breakfast buffet to fill up on prata, pineapple and poached eggs. Our voracious apetites could possibly have been due to the fact that we’d eschewed a ‘real dinner’ the previous night, both happy to make the most of the club lounge hospitality that was generously put on by Mr Losi, complete with numerous beers and nibbles and a scrumptious Birthday Cake for birthday girl Lenka and also as we were simply too shattered to consider going out anywhere. I confess it had crossed my mind many times that a (sleep-in/massage combo) posed an extremely pleasant alternative to slogging it out up the side of another mountain, yet with the ‘in for a penny…’ mentality, I organised my bike, loaded up on salt tabs and associated accoutrements and shuffled once again in my borrowed hotel slippers to the lobby for the day’s briefing. It seemed that most of the group were similarly happy to push on through the saddle sores and stiff quads heroically acquired from Day 1 and we left the hotel as a group of 16, only 3 down on the previous day’s number. With Mr Losi having sold the ride as a ‘lovely, shaded, low traffic 70km with 17 km of climbing at 3-4%’ I was looking forward to heading out of the city to take on what I thought would be a hill akin to 7 or 8 lots of our well-traversed South Buona Vista Rd. How pleasant. I’ll be the first to acknowledge I’m no mathematician but I now know that these talks of percentages/gradients etc can be manipulated to sound as ‘lovely’ or as ‘punishing’ as one wishes. Indeed, it was a 17km stretch of 3-4%, yet with the first 2km being basically flat, this meant that the next 15km were more like 5-7%, with a few ramps of 8-10% thrown in, just to keep us on our toes. After the previous day’s effort, this meant that quite a few of us were firmly entrenched in that dark space known as ‘the hurt locker’. Once again, the faster boys took off: Phipster (Hipster Phil), Ståle, Phil R, Raoul, Mike, Nico, Craig, Derek and Phil M. Laura, Bruce and I took it in turns pulling each other along for most of the way up, with one or the other of us taking off a little or dropping back, pace waxing and waning in tune with the gradient. Our quiet tapping away was only interspersed with gradient related Q&A and the self satisfied jubilance that broke forth when we were able to tell Laura, “11%, 11%… no 12%!!!”. This came to a rather abrupt end when autopause inevitably kicked in; the GPS unit turns itself off because you’re going so slow it thinks you’re not moving. Ho hum. It was, as Mark had described quite a peaceful, shaded, winding road, obviously popular with local cyclists, of all manner and shape, who called out friendly hellos as we (for the most part) were overtaking. Apart from the disgusting swathes of rubbish littering the roadsides once again, there was a certain natural charm and a lovely relief from the noisy haze of downtown KL. Then came the learner drivers. This road had obviously been deemed by the local driving school as a most excellent practice area for 14-year-old learner drivers. Sitting in tiny little Malaysian cars, gloriously bedecked in massive L plates, these learners would appear around every second bend, both moving and not. Note to self – give plenty of room and approach blind bends cautiously. Approaching the final km or so I felt a renewed surge of competetive edge, that I’d previously thought had been left to die a slow and painful death somewhere on the side of the road between The Wall and KL from the day before, and I stood up out of the saddle to put in a final strong burst to the finish. Not sure whether it was that Laura and Bruce were just too tired or didn’t realise they were in a race… (well that’s just silly) but they were content to let me be the next to the top, where the faster guys had been waiting for a little while. We chatted to a few more locals, admired a dessicated, small, black (probably highly deadly in it’s day) snake, downed a few chewy jubes and waited for the remainder of the group to arrive. One by one they came, Colin, Lenka, Mark and the group’s most stalwart trooper, Beverly. Planning for my typically cautious descent, I opted to leave with the first few heading back down, knowing full well from the previous day that with most others not quite as circumspect in their approach to the downhill as I, I would likely be overtaken fairly swiftly. One, two, three came swishing past as I resolutely feathered my brakes ever so slightly, constantly looking ahead to establish the best line down around each bend. Coinciding with a doof to the head from an out-of-control butterfly, a growing suspicion that this downhill thing could actually be quite fun started taking over. My hands were thanking me as I decided to ease up a smidge more on the brakes and allow the bike to swing out and down through each bend. “Wheeeeee! 5km down, 7, 9, oh what a shame, only another 5km to go, noooo! I don’t want this to be over… too much fun…” and then before I knew it, I was being hailed to stop by the lead guys who’d already pulled up at the icecream/drinks stop. As we called out, several more riders pulled to a screeching halt, with Nico refusing (in a somewhat ‘Frangry’ fashion) as we were apparently not at the officially designated shop. Not wishing to upset the French too much, we finished our icecreams, waited for Laura to take some (more) cute cat photos and remounted, conspiring to enjoy a second stop at the next establishment a few kms down the road. Standing in front of the well-airconditioned and brightly lit shop, we did our best to re-enter Nico’s good books, whilst waiting for the remainder of the group. With the group finally in sight, we were looking to saddle up once again when it became apparent that not everything was quite tickety-boo. As they approached, we realised Lenka was being nursed along in the middle of the pack, looking a little dazed, holding together a clearly compromised posture, with blood running down her arms from two fairly severely grazed elbows. She’d unfortunately hit the deck. As we gathered about to help patch her up, the story came out that she had indeed had an encounter with one of the aforementioned Learner Drivers. Coming around a bend a little too quickly, she was surprised to see one of the little cars almost stationary, blocking her lane. Taking evasive action, with a little overcorrection, she’d lost her back wheel, with her bike simultaneously diving into the ashphalt and bucking her off. Luckily she’d been seen by a group of very solicitous locals, who checked both her and the bike over and escorted her down the rest of the way. Putting on a brave face, Lenka declared that she was ok to make the 20km ride back to the city so we set off, ensuring that Lenka was well watched over. Huge thanks to Nicolas Chaste for organising this trip and to Mark Losi, Daljit and The Hotel ParkRoyal KL for tremendous hospitality. If you are interested in organising a similar trip, please contact us at committee@anzacycling.com to find out more. 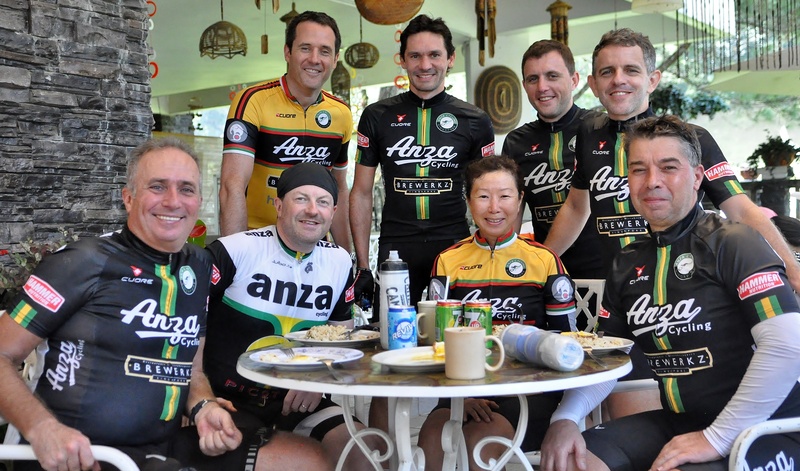 The last time I was on an Anza organised trip was the Bintan training ride last year. I had been waiting for such a trip to pop up, partly because I needed some hills training before going to France next month for the “6 cyclo du Vars”. Bukit Fraser, Cameron Highlands and Genting Highland are not new to me after having been out climbing those hills a number of times either on personal trips or with different groups of cyclists. So when this trip came along, Colin and I decided we would fly up as it is the preferred option for a short weekend. S$180 return with MH but if we have secured our bookings earlier we could have got away with less. Another thing we have learnt is never time your flight arrival to coincide with at peak time unless you want to spend hours in the KL traffic. Mr Aru, the hotel driver came to fetch us, he knows us well and the journey into KL city was a breeze. By 6pm, was had checked in at Casa Losi and were enjoying the hospitality “par excellence” in the club lounge whilst some were either still on the way or still milling around at Lorong 8, Toa Payoh from picture posted in FB. I didn’t get to see many of the ANZA riders until we met for breakfast the next morning. After mon petit-déjeuner, we quickly assembled outside the lobby. Don Losi gave us a short briefing of the ride and what we should look out for and the regrouping points. He gave instruction for Colin to lead the pack out and nominated himself to be tail end Charlie with van following behind him. I had been pre warned by Mr Aru that the weather had been really hot with temperature soaring to 37-38 deg C so I decided that I would stay close to the support van, not wanting to miss out on hydration. The pack rode off through KL city in true ANZA fashion, calling/pointing out potholes (which are plentiful) and keeping an easy pace. Barely 7 km into the ride, I had the first puncture but thanks to tail end Charlie and another rider who quickly helped fix it we were on the road again in no time. At 16km, we made a left turn and our “appetiser” was served. The Wall – steep @ 10% gradient but only 1km long. The pack got very excited especially those have not ridden the hills in Malaysia and not knowing what to expect. They blasted off and left moi and Mark gingerly poodling up together, keeping our form and in good rhythm, we got to the top and followed by a short descent and we headed on to the “first course“. Evian – 6km @ 5-6% gradient. We (Mark, Matt and I ) quickly form a pack and keep our rhythm. 2km up the climb, we could see from Matt’s body language that he need a push so the support van came to his rescue and he glued himself to the side of the van and made it up the top of “Evian” where we regrouped. Pretty busy up here, on the side of the road, there were a number of parked cars. The Malaysians drive up here, collecting water via a water pipe spouting out from the hills. Hence local cyclists named this hill “Evian”. A word of warning, a week before, I drank some of the “Evian” water and ended up having diarrhoea [too much information. Ed.]. A quick refuel and some banana cake and off the pack went again. A fast descent with some steep sections so the fast boys, showing off their descent skills, were seen racing against each other and never to be seen until Fraser clock tower. Whilst some were very cautious so riders were strung out immediately. 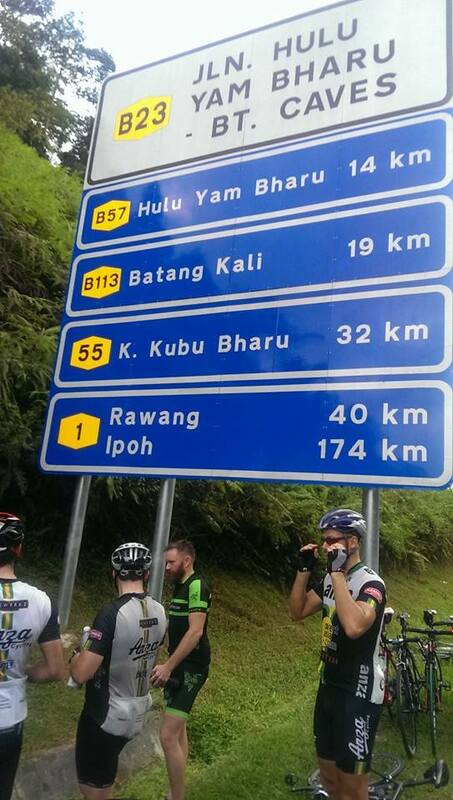 I eventually caught up with 5 other riders at Kuala Kubu Bharu (KKB) the next regrouping point. The 40km climb starts from KKB, Mark and I called it the “Main Course”. The first section of the climb was on big wide open road, no respite. Similar to “Red Road of Hell” of Bintan. Colin, Matt, Mark and moi were staying in a pack but not for long. Surprisingly, I was still feeling good and just wanted to get out of this heat asap. I pushed on, passed the reservoirs and entering into the 2nd section of the climb. The road lead us into the forested area, State of Pahang. Although the road became much narrower but it was a welcome sight as it was shady and much relieved to me. Then out of nowhere, Colin appeared right behind me[Just like at home? Ed.]. I was setting the pace and after 10 mins, I lost him. Not seeing any other ANZA riders ahead of me I was very much one with nature, onwards and upwards until I ran out of hydration. I Waited 10 mins, Matt, Mark, Colin and support van came. We kept each other within sight until we passed the place where vicious dog was which means we were almost at the “Gap”. From “Gap” to Bukit Fraser is about 8km, avg 5% gradient. It was heavenly riding up this winding road, you could hear birds chirping, buzzing sound of the insects from tropical forests and occasional revving of engines passing me, with some giving me the thumbs up sign. It was completely a different world until I reached the clock tower. Finally the last rider made it up, all accounted for. We had our hard earned lunch. Mugshots were taken in front of the famous landmark. By which time the fast boys were eager to do the 40km descent. Off the pack went. It was absolutely awesome, making the ascent so much more worth the effort. We regrouped at KKB again and it seemed to be the last we seen of some of the “missing riders”. Here was where the fun began. As we were riding along with tail end Charlie, we had first rider needed to got on the van, that left 3 of us. As we approached “The Evian”, we picked up another tired body and soul. Over the “Evian”, we picked up another rider and pack him up the van. We continued on and 5 mins into the descent, we saw #Nicoinafrenzy #Nicolostkermitandmuppets #Nicorefusetocycleon. We started calling riders. #Noanswerlah #Cannotgetthrulah. After some coaxing from Mark, Nico continued with his ride, we picked up 2 more riders. From then on as it was getting dark and some of us are without front or tail lights, we made a decision to stay together, with support van giving us a protection. We finally rolled in together. I was ecstatic as this is my first round trip to Bukit Fraser, and longest distance ever clocked in. My garmin showed 198.7km. Most importantly, I could hear the music playing in my ear “I’m still standing”. Toro, you have set the bench mark! I would like to say merci beaucoup to the ANZA Cycling committee for the generous support of van with ice cold beverages and cakes and especially Don Losi and his staff for their “par excellence” hospitality, in every aspect including extending the bar hours. To Nico for organising this trip. It would not have been possible without all of your hardwork. I am 37 year old Norwegian guy. I am married to an Australian and we have two kids. I currently work as a personal/group trainer for a small local firm. Where are you from and how long have you been in Singapore? I come from a small village in inland Norway called Tynset. It’s known to be one of the country’s coldest places with yearly average temperature of around zero degrees Celsius. It’s has excellent terrain for cross country running and skiing as well as mountain biking. I have been in Singapore for three years. How long you been riding? 3 years. I bought a road bike the week I got here. Whats in your bike cabinet? I have just a box with tools, some spare parts, tubes, etc. It must be the Bintan Lagoon Classic race this year where I came second. Most embarrassing moment in life? There are a lot to choose from, but none worth mentioning. Most embarrassing moment on a bike? Nothing serious, but I fell on the top tube as I slid of the pedals and almost falling of the bike as traffic light turned green, entertaining/irritating a dozen or so spectators waiting to drive. Words of wisdom for the club members? Come up with and follow your own words of wisdom. What’s the last song you’d play before a race to motivate yourself? I am not actually listening to any songs, but AC/DC’s Thunderstruck boosts my energy levels. If your life were a film, who would you want to play you? Favourite SG ride and why? A standard Kranji, because i find it quite varied and I know it well. Where can you be found when not on the bike? At home, travelling around Singapore training other people, playing with my two lovely children. Best ride in the region that you have done? I have not done many. 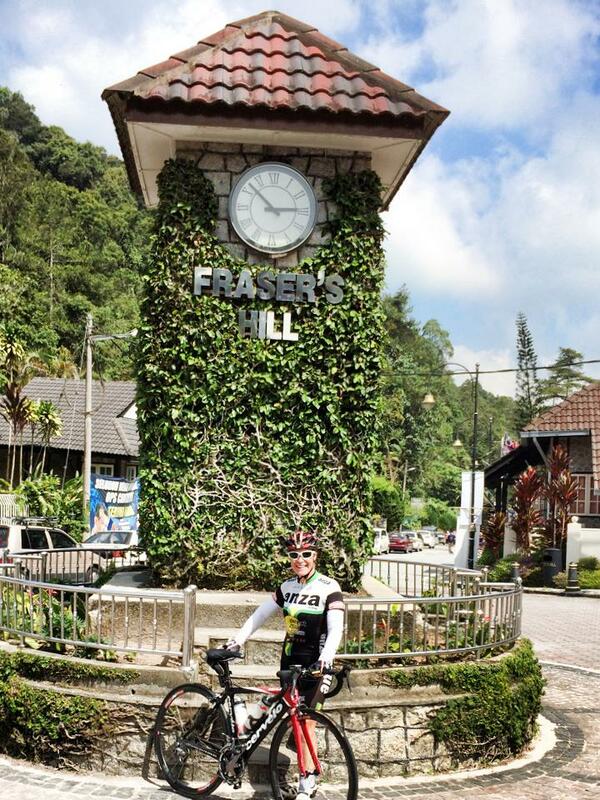 I just went up to KL to do Fraser’s Hill last weekend. That was very good for hill training. Cycling ambition still to be tackled? I am thinking about a race in Norway that goes from Trondheim to Oslo called Styrkeprøven(‘The strength/toughness test’). It’s 540km (in one go if you wondered). 3 words which best describe you? (I would like to think) organised, kind and reliable. You’re known to most for your great effort in the recent Bintan race. How did you feel after crossing the line? Exhausted after battling with cramps the last 8-10 km. I didn’t know winner Richard Paine and I were the two first to cross the line in Cat 2. I thought there were a group in front of us all the time since we broke away from the peloton with about 50 km to go. I was looking ahead around every bend to see if we were gaining on them, but the group I was chasing existed just in my head. I must pay better attention next time. Whats it like having a wife that also rides? Does it make it easier or harder to buy new bike stuff now? 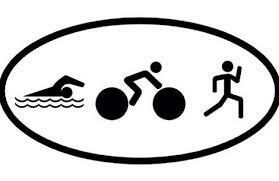 Description: Multiple-reps of cycling and running repeats to get you conditioned for the demands of multi-sport racing. Get fit for cycling AND running in a two-for-one race-pace/tempo session on safe, challenging, and scenic ‘back-to-nature​’ routes on two wheels and on foot. Do the number of repeats (and tweak the distance/intens​ity) depending on your event distance – from sprint distance to Ironman! Holidays, are they worth it? So I’m off to France in 4 weeks to ride up a couple of small bumps. Much like doing SBV followed by Faber I’m told. I mean when the Clementi flyover went up, it doubled the available climbing in Singapore so just how hilly can France be? Why is it that the closer I get to a holiday the larger my workload becomes and when I get back I’ll have the pleasure of an email inbox that will be dominated by emails from our IT department saying my inbox is full. Stop telling me my inbox is full and then maybe it won’t be is all I can say! Don has been hard at work searching out variations to ride routes across the island and now knows every possible Kranji variant. He also has a solution for those of you who travel too much for work, and just don’t find CNN or BBC World motivating enough in the hotel gym. I’m looking for your ideas to help me set my agenda for getting stuff done for you all this year, so put your thinking caps on and be ready to roll up your sleeves and help. And Martin, as reliable as ever, has news for those of you for whom riding is just not punishment enough. VP Page – So Now What? Wherever you are this weekend, let’s be careful out there. First, a huge thank you to those of you who voted for me for VP of our cycling club. Whether you voted for me or not, I will do my best not to disappoint you. Assuming the next AGM is in May 2015 and that people are thinking about what the committee has done about a month before that, I reckon I have about 10 months. I thought about putting in place a scheme where the club would buy all your unwanted bike parts at above market rates but that sort of policy seems to have backfired in other countries in the region so we’ll steer clear of outright buying your affections. So for a couple of weeks I’m crowdsourcing ideas to see where you want us to focus attention. To get the ball rolling, I’ve been sent one already which ties in with the great work Nico has been putting in organising club trips to Mersing and KL. We already have guidelines on what sort of trip will be eligible for club funding, so I want to sort out a rolling calendar of rides covering a rolling 12 month period that will (almost certainly) run with club support and funding so that you can think about what ride you want to do and when. I’d like to form a small trip working group from the member (all starting to sound too much like work now!) but let’s try to do it over the TdF or Vuelta so we can enjoy the cycling at the same time (I have Eurosport unlike many bars or restaurants so I’m happy to play host). What do I need from you lot? Simple really, I want your ideas, and some indication of whether you are willing to help make them happen, and in relation to the ROTM, anybody who wants to be involved in getting that off the ground (Nico, you’re already in, there’s no escaping now). I’m looking forward to seeing what you all come up with. 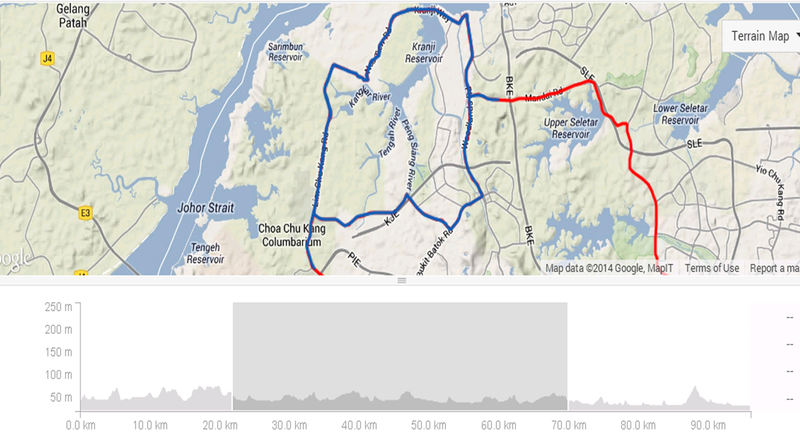 That being said, Kranji is a mainstay of SG cycling ( my Strava says I’ve done it 192 times!) and there’s a number of ways it can be incorporated in loops to make it more interesting, challenging or just to get more distance. Occasionally the Fast Kranji group shoehorn these into the Saturday rides and this is something we’d like to encourage more off this year. This one is probably the most well known and ridden of the Kranji variations. A favourite of the Fast Kranji group in the lead up to races. The loop adds ~30km to a regular kranji by looping back at the end of LCK, heading up the rolling hills to Coastguard Sprint and then a reverse Kranji to the dam before u-turning into a normal kranji again. It gives approx 35km of challenging terrain with the chance of only a single light. Less complex than the Killer Loop, Crazy Kranji effectively merges the loop from the Sunday Cycleworx Crazies ride into a Kranji. 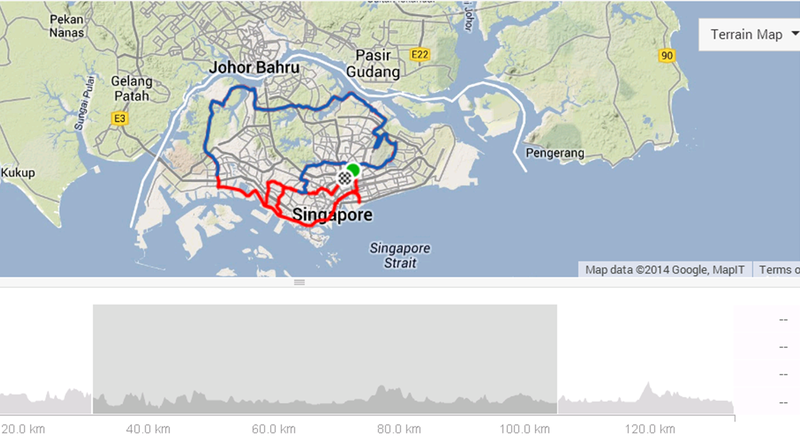 Do a normal Kranji Loop and then hang a left at the end of LCK onto the super smooth Brickland Road. From Brickland, follow the Crazies route back to Woodlands Road via Bukit Batok but don’t turn back onto Mandai. Simply keep going straight and then into a normal Kranji. This option has more lights than the Killer Loop but still adds another 30km to the standard route. Recently piloted into the club by Pete Bennett, this one isn’t so much a Kranji variation as a new, longer way to get there. From Food Canopy, head up Adam Road but stay on the flyover all the way past the usual Thomson turnoff ramp. The flyover continues for another 16km of uninterrupted bliss till you get out just before IKEA at Tampines. Hang a left through Punggol, Seng Kang , Mandai and into a standard Kranji. Traffic is a bit heavier on the Bartley Road flyover but the lack of traffic lights makes it a great ride for a smaller fast group. This option turns the Saturday Kranji into a 100km loop from Food Canopy. Do let us know in the comments if you have any other variations to recommend.